I've been enjoying sour patch kids since I was in first grade, I practically ate them every day through high school. Who would have thought that my six year old self was way ahead of what appears to be the next emerging diet fad: The Sour Patch Breakfast. A recent study created by a food sciences and nutrition grad student at UC Davis tracked a group of participants who ate half a bag of sour patch kids for breakfast every day. Over a 3 month period they lost on average 30 pounds more than the control group. Needless to say these findings surprised the study participants and the nutrition community. After all it seems counter intuitive that sugar coated in sour sugar would do anything but pack the pounds on. Everybody knows that breakfast is the most important meal of the day. A proper breakfast will kick start your metabolism in the morning and begin burning calories, if you miss breakfast your body will think you are starving and will go into survival mode. Several diet plans have built on this idea including the '4-Hour Body' which suggests people eat 30 grams of protein in the morning. 30 grams of protein is a tough meal to swallow before heading off to work, so the study sought to replace the protein with the highest concentration of sugar possible. Sour patch kid's high levels of sugar, in the form of corn syrup, kicked the participant's metabolisms into overdrive burning astonishing amounts of calories in the hours leading up to lunch. There is another theory that has emerged from the UC Davis study. Researchers at other universities believe that the high amounts of tartaric acid found in sour patch kid's sour coating bind with semi digested molecules from the red #40 dye in red sour patch kids. They believe this string of molecules enters the blood stream and binds to the chemical receptors in your brain that perceive hunger, temporarily fooling your body that it is not hungry. This theory has not been proven but prelimanary evidence is enough to get the nutrition community very excited. So next time you go to make breakfast, don't reach for a banana, cereal, eggs or yogurt. 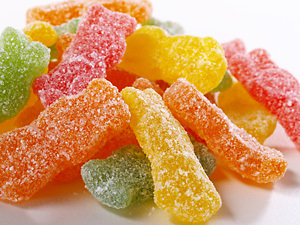 Instead open up a bag of sour patch kids, your waistline will thank you. Due to the fact that this post has been referenced by a legitimate media source http://www.examiner.com/children-s-nutrition-in-national/how-much-protein-should-you-feed-your-children-at-breakfast-time , the lawyers at That’s What She Fed have suggested that I notify readers that this was an April Fools post as evident by the posting date and the comment stating that it was an April Fools joke. Although sour patch kids are a delicious snack and UC Davis is one of our nation’s top universities, there is no correlation between sour patch kids and weight loss as the facts contained in this post were a figment of my imagination. I promise next year’s April Fools post will be less believable. Dbal max Looking for proven, effective Dianabol for Sale without side effects? Discover premium Dbal-Max Pills currently helping guys build mass safely. Phen375 is in reality a standout amongst the best fat burners since it adopts a various strategy to weight loss. Plus, it is free from any of those dreadful symptoms, which implies that you can get more fit without doing any mischief to your body. This is the thing that separates this diet pill from the group. Along these lines, on the off chance that you are truly excited about getting more fit, it would be a shrewd choice attempt Phen375, Buy Phen 375 which is evaluated as a standout amongst the best fat burners accessible available. functions before you proceed to make utilization of it. WeightNosis.com is a weight loss hypnosis audio program created by Dr. Steve G. Jones to help you overcome emotional eating and bad habits. Hypnotherapy for weight loss helps you to lose weight naturally. The main reason Why diets don't work is because, in order to achieve permanent weight loss you have to make permanent changes to your eating and exercise habits. Weight loss is useful for some conditions. It is of genuine advantage in diabetes, hypertension, shortness of breath, joint issues and raised cholesterol. also moved the Music folder to the new microSD. Great food science recruiter article. I Rose Fanta am a Food Science Recruiter for the food science industry. We are a food science recruiting firm that recruits food manufacturing and food science applicants for food science jobs. PhenQ is a fat reduction diet pill created to help lose fat, control appetite, and enhance energy levels. It’s created using what the organization claims are clinically confirmed ingredient for losing weight via 5 various ways. See the these phenq results now. Very inspiring blog post.A good blog always comes up with a new or excited information, I read all the facts about the kids weight loss.I am a father of two kids and I implement these facts that you have been mentioned.Keep sharing more about the relevant task.If you wants to calculate your weight on daily basis you can use this Weight Loss Calculator,it shows the appropriate results. affordable care act insurance policies Loving the information on this site, you have done great job on the content . While genes can cause some people to struggle with their weight loss effort, if the right kinds of foods and exercise are employed, they will definitely lose weight. Skinny girls who are trying to gain weight are sick and tired of searching for credible information where to buy apetamin in houston texas on how to gain weight as a result of the inundation of weight loss information crowding the web. With the flood of weight loss products many skinny girls lose hope of ever getting the chance to gain weight. Skinny girls don't give up just yet as I'll reveal to you 3 simple tips on how to gain weight. In this review, I will go into Waist Trainers for Women as detailed as possible, based on my experience and my research. I will explain my experience, how it affected my daily life and what I have learned about waist trainers. I will talk about its positives and its negatives, and how it affected me personally. If I had to use one word to describe this blog it would be GRANDILOQUENT. Some medications that slow blood clotting include aspirin, clopidogrel (Plavix), diclofenac (Voltaren, Cataflam, others), ibuprofen (Advil, Motrin, others), naproxen (Anaprox, Naprosyn, others), dalteparin (Fragmin), enoxaparin (Lovenox), heparin, warfarin (Coumadin), and others. The most outstanding component about this blog is the means by which it doesn't neglect to keep its gathering of people connected with at each point. Este mai probabil să rămâneți subțire dacă vederea din fereastră include dealuri, apă, un parc sau o stradă care duce la unul dintre aceste lucruri. Băutul Black Latte dimineața devreme este, de asemenea, foarte util în arderea grăsimilor și a altor deșeuri din corpul dumneavoastră. I am so waiting for another blog like this, Totally in awe of the article.